This weekend Hasbro is not at one con but 2! While the Paris convention hasn’t revealed anything……………yet, the MCM London convention has revealed the remainder of the Kingpin wave. A reminder that the Kingpin will include New Black Suit Spider-man, Red Goblin, Mob Boss Black Cat, Silver Sable and Night Thrasher. You may have noticed that there is only one Spider in this wave. Well, Hasbro doesn’t do a Spider-man wave without at least 2 version of Spider-man. The second Spider-man figure will be the highly requested Six-Armed Spider-man. This is from a storyline that saw Spidey trying to get rid of his powers but instead grews 4 extra arms. This storyline is what the famous Man-Spider storyline from the 90’s cartoon is slightly based on. Unfortunately, it looks like the torso section’s articulation had to be sacrificed in order to make this figure. 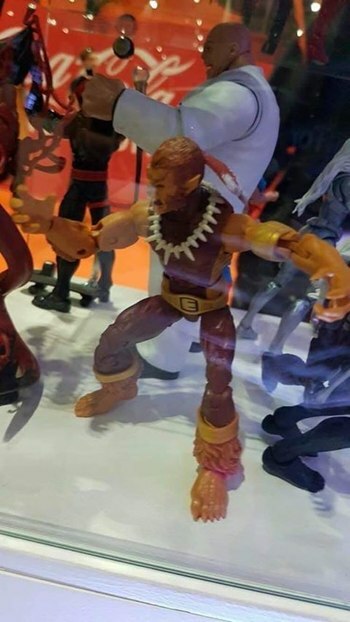 Joining this figure is a character that is both villain and ally to to Spidey, Jason Fireheart AKA Puma. The Native American has the ability to become a Puma-like were-beast. He started out as a villain to Spidey, believing he was a bad guy, but eventually became a close friend and ally. This also marks the 4/5 member of the Outlaw, a team of former villains of Spider-man created by Silver Sable with Sandman and Prowler also been members. Will-O-Wisp and Rocket Racer when? The pretty Hi-Res pictures will be out later and there may be more figures revealed either today OR during the Weekend so check back then.